Results: Once only possible with expensive liquids and large amounts of waste, scientists can now create an efficient, easy-to-separate catalyst with small amounts of material, thanks to an innovative approach from Pacific Northwest National Laboratory. 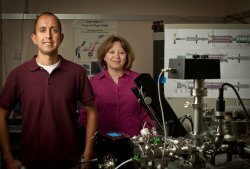 Dr. Julia Laskin and Dr. Grant Johnson employed collisions between ions and molecules within a mass spectrometer, a popular analytical technique, to manipulate ruthenium-centered ions in the gas phase. The resulting highly reactive ions, which cannot be generated easily in solution, were then gently deposited onto a selected surface. The product is a catalytically active material that may one day be used in fuel cell and solar energy storage applications. "Using the unique capabilities of a mass spectrometer we can manipulate an ion in the gas phase and obtain a material that is unattainable in solution," said Johnson, a physical chemist and a Linus Pauling Distinguished Postdoctoral Fellow at PNNL. Why It Matters: When it comes to producing fuels, whether bio- or petroleum-based, catalysts drive the reactions, thereby reducing cost, inefficiency, and waste. Scientists at PNNL and elsewhere are working to design catalysts that combine the selectivity of homogenous catalysts with the ease of use of heterogeneous catalysts. Heterogeneous catalysts, which are less selective, are commonly used because they are easy to separate from the reactants and products. This study shows a new approach that allows scientists, for the first time, to create unique, easy-to-separate catalysts. Methods: Laskin and Johnson selected the ruthenium tris(bipyridine) complex to study because of its applications in solar energy conversion and oxidation catalysis. The complex has a ruthenium metal atom surrounded by a set of three ligands, strings of atoms that wrap around the ruthenium center. With all three wrappers in place, the catalyst is fairly unreactive. However, removing one of the wrappers and partially exposing the metal center makes the complex catalyze reactions that turn simple chemical feedstock, such as ethylene, into valuable chemical intermediates such as ethylene oxide. "This ruthenium complex has been a hot topic lately," said Laskin. In this study, the scientists began by putting the ruthenium-centered catalyst into the gas phase using electrospray ionization. Then, the ions were focused through an ion funnel. They accelerated the ion beam to cause the ions to collide with gas molecules inside the vacuum chamber. The collisions caused the ligands to snap off, exposing the catalytically active ruthenium core. The ions were then passed through powerful oscillating electric fields that separated out the desired unwrapped ruthenium ions. The researchers directed a beam of the desired ruthenium ions at a surface, a carboxylic acid terminated self-assembled monolayer atop a very thin layer of gold. They transferred the surface into a time-of-flight secondary ion mass spectrometer (TOF-SIMS). Using the data from the in situ TOF-SIMS, they determined that the unwrapped ruthenium-centered catalysts adhere strongly to the surface and exhibit behavior that is consistent with the catalytic oxidation of ethylene to ethylene oxide. What's next? The team is continuing to investigate the possibilities of generating new catalytic species in the gas phase and depositing them onto surfaces. This work will further the controlled preparation of materials that are necessary for advancements in catalysis and solar energy conversion. Acknowledgments: The work by Grant Johnson and Julia Laskin was funded by the Chemical Sciences, Geosciences, and Biosciences Division of the U.S. Department of Energy's Office of Basic Energy Sciences, and the Laboratory Directed Research and Development Program at PNNL. The work was done by Julia Laskin and Grant Johnson at EMSL, the Environmental Molecular Sciences Laboratory, a national scientific user facility at PNNL. Learn more about the deposition technique used in this research. Reference: Johnson GE and J Laskin. 2010. "Preparation of Surface Organometallic Catalysts by Gas-Phase Ligand Stripping and Reactive Landing of Mass-Selected Ions." Chemistry: A European Journal 16, 14433-14438. Like tiny molecular chefs, catalysts take the ingredients or reactants at hand and create the desired products. Some catalysts are very efficient, while others are much slower. The slower ones, however, are more commonly used, because they are easier to work with. Scientists want to design catalysts that are efficient and easy to use, getting the best of both worlds. Homogeneous catalysts are efficient because they work in the same phase as the molecules they are acting on; that is, a liquid catalyst works on liquid reactants. Homogeneous catalysts are prized for their high selectivity toward a desired product. However, they rack up costs, as they must be painstakingly separated from the products and remaining reactants. Also, these catalysts often reside in liquids with undesirable toxicities. These toxic materials increase the risks to workers and increase the costs of waste disposal. Heterogeneous catalysts are in a different phase than their reactants and products. For example, the catalyst is a solid that acts on liquids or gases. Heterogeneous catalysts are easy to separate from the reactants and products. However, they are often less selective than their homogeneous counterparts. Lower selectivity translates into needing more reactants and producing more unwanted byproducts, thereby incurring more costs.